Our modern society depends on lithium-ion batteries, which currently are used to power an increasingly diverse range of applications from large ships down to microchips. Safer batteries with high capacities and improved power capabilities are needed for future applications, and 3D structured all-solid-state batteries is one approach that could fulfil these demands. The main goal of the current project has been to manufacture functional all-solid state 3D thin-film micro-batteries by atomic layer deposition. The current project has focused on conformal coating processes and solid electrolytes as well as cathode and anode materials for batteries. 3D structured batteries have been attempted, however, a fully functional device was not realised. New solid-state electrolytes combining organic- and inorganic materials were made, showing promising potential. The major outcome of the current project has been the gained insight into the interfaces occurring when materials are combined, thus opening for a functional demonstrator in the near future combining polymer thin films with ceramic properties. 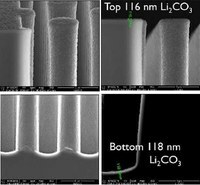 “Methods for forming lithium manganese oxide layers” Nouha Labyedh, Marina Yurievna Timmermans, Philippe Vereecken, US 15339577 A1, Pub. Date: May 04, 2017. Related to the conversion of EMD (electrolytic MnO2) to LMO (LiMn2O4) by coating with Li2CO3 using both sold-gel process and ALD coating. “100 nm Thin-Film Solid-Composite Electrolyte for Lithium ion batteries” Xubin Chen and Philippe M. Vereecken, Adv. Mater. Interfaces 4 (4), 1600877 (2017). DOI:10.1002/admi.201600877.